After a restless night made even more restless by some insect clicking on my ceiling throughout the night, I got up and went down for my ‘biological breakfast’. I’d been intrigued by the thought of it ever since our promoter had mentioned it the previous day. I can now inform anyone who was wondering (as I was) that a biological breakfast consists of yogurt (served in a shot glass), orange segments, orange juice, a slice of jammy cake and a ciabatta filled with a slice of salami – so now we know! I washed my biological breakfast down with a herbal tea of some description – the only tea bag whose packet didn’t have a single letter that I could understand; the entire packet and rapper was written in Chinese, making it the most appealing choice! 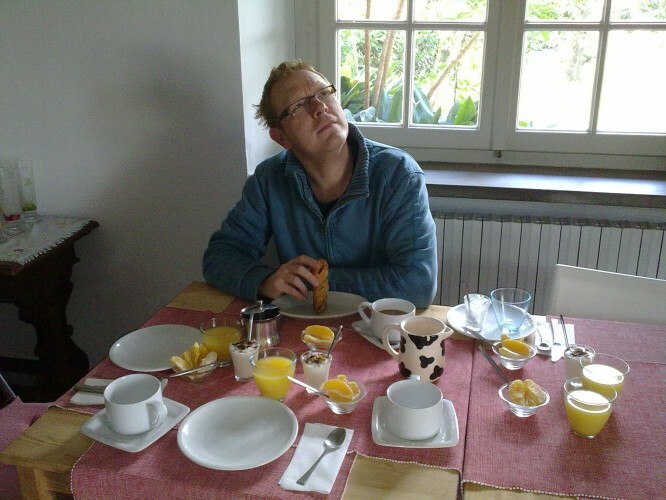 After we’d finished our biological breakfast we set off for Rome – a drive that took us most of the day. When we arrived in Rome there was just time to check into our hotel and have a quick shower before we had to head to the club for the evening’s concert. What should have been a short drive took us over an hour as we hit Rome’s rush hour traffic. 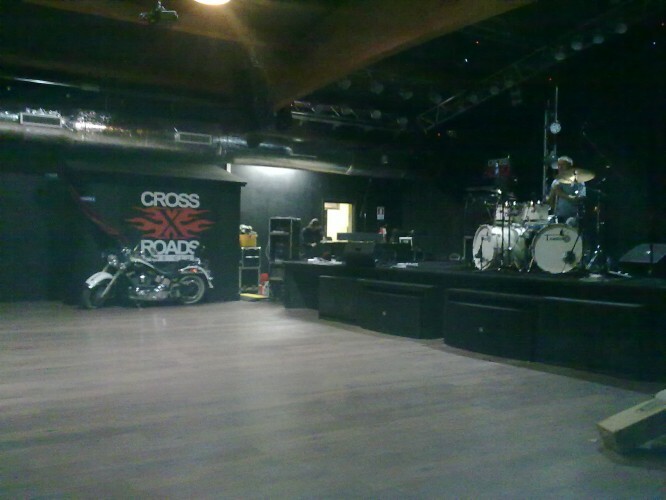 When we eventually arrived at the venue we found a large club with a Harley Davidson parked next to the stage. We were shown the way to the dressing room – down a corridor that led off from the stage. As we walked down the corridor we noticed a VERY strong smell of gas. When we reached our dressing room we found that the smell was just as strong there. After about half an hour of sitting in our gas-filled dressing room I started to feel light headed and sick, so I made my way out to the stage and sat in the hall for the while. I explained to Carl that I couldn’t go back into the dressing room and he said that he was getting a headache from the gas too. When we asked them for another room they told us that there wasn’t one, but, if we’d like, they could turn the gas off and open the door. Perplexed at why they wouldn’t do that without us asking (maybe they thought that we’d like to get high before the show?) we started our sound check. During the sound check I noticed that a few of the controls on my guitar were crackling and, in certain pickup positions, the level of my guitar would drop significantly. I eventually found someone with some switch cleaner. I sprayed the switch cleaner on the offending knob and switch, hoping that would do the trick. After our sound check we went to the club’s restaurant for a dinner of Penne Arrabiata and the largest pizza know to man. After dinner we returned to the dressing room to find the smell of gas had gone. We had a couple of hours to warm-up before we were due to go on stage – this I appreciated as before our sound check Carl had introduced me to the members of an ELP tribute band; apparently the keyboard player is very good and knows all Keith Emerson’s keyboard parts inside out… no margin for error tonight then! 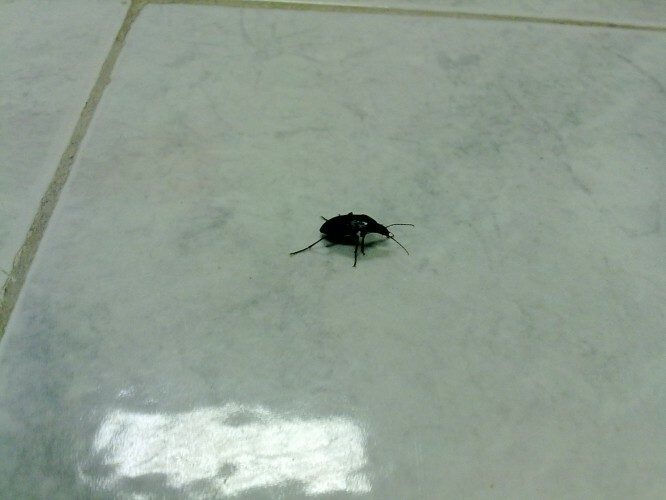 In the dressing room we made a new friend – a small black beetle kept us amused the whole time we were there as he (or she, I’m not sure how you tell) raced around the centre of the room; he didn’t stop once until I tried to take a photo of him, then he stood perfectly still until my camera’s flash went off, at which point he sped off his on crazy journey again! When it was time for us to go on stage Guido, an Italian journalist who we’ve become friends with through our numerous visits to Rome, gave us a little introduction before our intro music started. The gig went well. My guitar developed its level problem at one point of the show – in the intro to Trilogy. I had to stop playing (thankfully I do the intro to that song on my own, so it wasn’t too disastrous), I waggled my pick-up selector and tone knob until I had a strong signal again and then continued with the song. After that I tried not to touch the tone control on my guitar. I really must get this sorted before our next gig tomorrow. The audience was enthusiastic and, at the same time, attentive – hanging on our every note in the quiet sections of songs and wildly applauding and clapping along with other sections. After the show I spent a long time meeting people. When we were ready to leave, we said our goodbyes and headed back to our hotel.